Not just another retelling of the Macross saga... the story continues as we bring Carl Maceks original vision full circle. 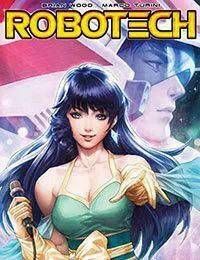 Taking into account every iteration of the series, this new Robotech casts a fresh eye over classic characters like Rick Hunter, Lisa Hayes, Lynn Minmei, Roy Fokker, Claudia Grant, and Henry Gloval. Brian Wood and Marco Turini take us back to a Macross Island where *nothing* can be taken for granted.